the white hat | Badudets Everything Nice! After tasting White Hat, Red Mango and Yoh-gurt Froz, I thought I tasted all varieties of what frozen yogurts can taste, tart, sweet, creamy, sour, tangy, etc… No matter what the taste is, I can easily tell even on closed eyes that I’m eating frozen yogurt, it’s just different from ice cream. I need to have a double take because something this good can’t be frozen yogurt, it tasted like real ice cream! But yeah, it says frozen yogurt, and it’s too good to be true. 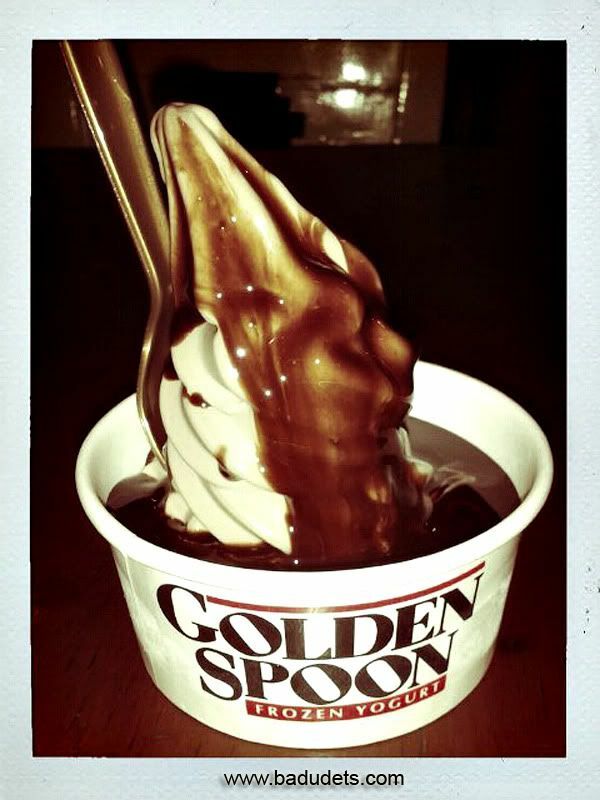 It may not come cheap for Php 155 a cup but you get what you pay for, frozen yogurt from heaven. This paragraph is so full of superlatives, just grab yourselves a cup okay? Remember the very first time I tried frozen yogurt at White Hat? After that, I became a frozen yogurt lover. As much as I wanted to try Lulubelle’s, it’s too far from where I live and work so I just settled with White Hat. But as frozen yogurt becomes more popular, Red Mango enters the scene. 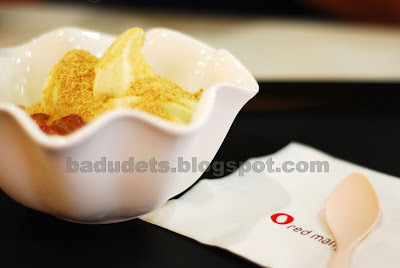 Red Mango is popular in the United States and I’m sure it will also be a hit in the Philippines. 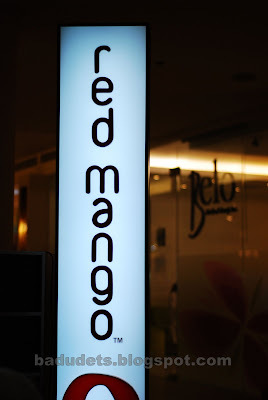 Red Mango opened its branch at the 3rd Level of Trinoma, in front of Toys R Us and Fitness First. Of course, this frozen yogurt lover can’t wait to try it and so we went. I was surprised to see that they have Green Tea flavored yogurt, but they also have the original one. They also have Yogurt Smoothies, organic coffee and tea and waffles. treat yourself well… yogurt is good for you! I had a 6 oz. Green Tea yogurt, for the toppings, the lady in the counter suggested that grapes and crushed Grahams goes well with Green Tea yogurt. Jeff ordered Kiwi Yogurt Smoothie. A 6 oz. green tea yogurt is Php 120, the original flavor is Php 115. Just add Php 20 for 1 toppings, Php 30 for 2 toppings and Php 40 for 3 toppings. 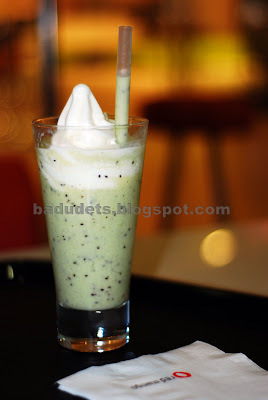 Yogurt smoothies are Php 125. Red Mango’s yogurt is creamy, I can’t taste the tartness that I expected for a yogurt. The combination of crushed Grahams and grapes was a hit for me. The Yogurt Smoothie is more delicious when you mix the dollop of yogurt on top. 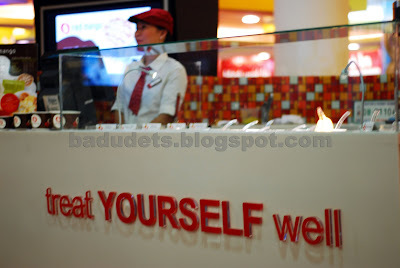 In comparison, White Hat offers more variety for toppings while Red Mango is limited to fruits and cereals. For the taste, I think both of them are a winner! Try them for yourselves.